Today I screened for my students Elvis ’56, a documentary about Elvis’s emergence as a national figure in 1956. 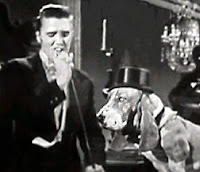 While I was aware of how quickly Elvis became a controversial figure, I hadn’t realized until watching the film today how swiftly Elvis was domesticated, by which I mean how swiftly his “wildness” was controlled, overcome, tamed, made tractable, “hemmed in.” Humiliation was a key strategy in Elvis’s domestication, as revealed when, properly attired in a nicely-fitted tuxedo, he sang “Hound Dog” to a basset hound on The Steve Allen Show on 1 July 1956. It was Jacques Ellul who introduced the concept of the “propaganda of integration” in his book, Propaganda: The Formation of Men’s Attitudes. By integrative propaganda, Ellul means the sort of propaganda that promotes acceptance of the status quo, conformity, and passivity, and by the use of the word domestication in this context I mean to invoke the idea of integrative propaganda, that is, made to conform and the diminishment of a threat. Elvis’s national humiliation—being required to sing “Hound Dog” to a dog on the nationally-televised Steve Allen Show on 1 July—took place a mere five months and three days after his first appearance—his first exposure to a national audience—on the Dorsey Brothers’ Stage Show on 28 January. It is often claimed that Elvis’s crucial period took place from January 1956 through September 1958 (not even three years), but arguably it was a much shorter period than is commonly understood. According to Elvis.com, Elvis appeared on American national television in 1956 on the following dates. His performance of the ballad, “Love Me Tender,” and the gospel tune, “Peace in the Valley,” represent further stages of his domestication, the final step being his military career. After the following dates, he would appear on television just three more times during his lifetime.